The brand new Rugby Australia Building, built in partnership between the University of Technology Sydney (UTS), Rugby Australia and the Sydney Cricket and Sports Ground Trust, is now open in Moore Park. More than 700 Sport and Exercise students and researchers have the pleasure of learning alongside elite athletes, with access to valuable performance, injury-management and rehabilitation data. A major sporting milestone in Australia, this state-of-the-art centre is the official home to the Qantas Wallabies, Wallaroos and Australian Men’s and Women’s Sevens teams as well as UTS Sport and Exercise and Physiotherapy disciplines. Classes at the Moore Park precinct provide a wonderful opportunity to engage learning in an exciting and vibrant sports environment. 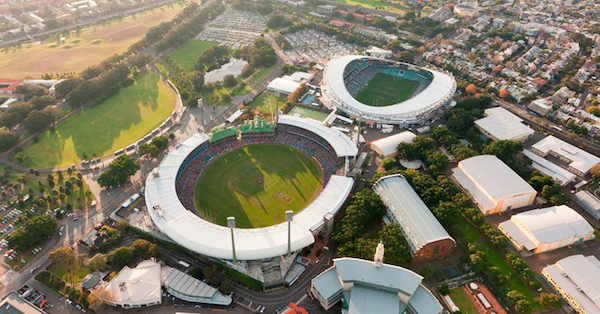 Students are in close proximity to the elite sports based at Moore Park, including cricket, rugby league, rugby union, Australian rules and football. This partnership marked the first of its kind in Australia, integrating an academic precinct within world-class sporting facilities. This space is shared by academics and research students in UTS’s sport and physiotherapy programs. The mix of open-plan workstations, quiet rooms and social spaces are designed to support different tasks and ways of working. This space is used for measuring and developing perceptual-cognitive skills in high-performance athletes and officials. It incorporates a running track with a vision projection wall and 3D motion-analysis technology. Head cameras and eye-tracking glasses worn by athletes allow researchers to understand how high-performance athletes move and interact with each other. The sports hall accommodates coaching activities among other teaching practicals. This versatile space can be used for indoor sporting games, performances or community events and can be converted into other sporting courts including basketball, volleyball and badminton. The sports hall is also used for rehabilitation work conducted by the university’s physiotherapy program. Serving as a central spine extending through UTS's main floors, the stairway both encourages pedestrian movement and acts as a social gathering space. The green steps and pink handrails echo the colour scheme of UTS's former Ku-ring-gai campus, once home to UTS sport and exercise science disciplines. An open-air running track on the top-floor roof terrace is used for practice-based teaching, including the assessment of speed and acceleration amongst athletes. It commands expansive views of the Sydney skyline, including the UTS Tower. Connected to the adjacent biomechanics research laboratory and biochemistry lab, this space is equipped with treadmills, exercise bikes and rowing machines as well as a range of devices used to assess physiological responses to exercise. Using technology that digitises movement, researchers can measure the impacts of speed and other forces placed upon the body during exercise. A small space but an important one - the temperature and humidity controls allow researchers to investigate the impact of environmental conditions on athletic performance. The aim is to develop interventions that mitigate the impacts of heat and humidity experienced by athletes. Primarily a teaching space, this resistance (weight) training room is where sport and exercise science undergraduates gain practical experience in prescribing and supervising exercise. Equipped with a DEXA (dual-energy X-ray) machine, this lab measures athletes’ bone density – as well as muscle and fat content – providing a precise assessment of body composition that feeds into both health and performance outcomes. UTS operates a free shuttle bus between the City campus and Moore Park during peak periods. Please note that there are a maximum of 24 seats on this bus. Public buses operate frequently to Moore Park. Moore Park precinct is a 28 minute walk or 15 minute bike ride from Central Station. © Copyright UTS - CRICOS Provider No: 00099F - 11 January 2019 03:36 PM. The page is authorised by Dean and Faculty Manager, Faculty of Health.